Dan appeared on Good Morning America, continuing to cover the death penalty phase of the Jodi Arias trial. Arias, 32, was charged with first-degree murder of her ex-boyfriend Travis Alexander. Yesterday, the jury began deliberating whether she’d receive life or death. After just two hours of deliberating her sentence, the jury said they could not agree – but the judge sent them back. 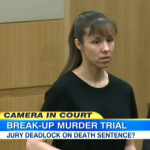 After five more hours of deliberation, the jury remained deadlocked, and will continue today. If not given the death penalty, the judge can choose life in prison, or even life with the possibility of parole. Dan says, “[The jury] has already deliberated this for many many hours; they deliberated the ‘is she guilty? is she not?’ so they sort of know what others think on the jury. So they very quickly came back and they said, ‘Your Honor, we just can’t reach a verdict. '” Though they continue to deliberate, what happens if they can’t agree? Dan answers, “At some point, the judge will declare it to be a hung jury, and at that point, one of a number of things happens: either, the prosecutor says ‘we’re going to pursue the death penalty again,’ a new jury is impaneled just on the issue… the other possibility is that the prosecutor says ‘I’ll try to cut a deal with Jodi Arias. '” Find out what both options mean here.